Apply today to find out the most competitive personalised finance rate for your big day. We provide competitive interest rates and offer flexible repayment schedules. Industry-leading personalised service tailored to suit your wedding. Apply for your wedding loan through our fast, secure online application form. Applications are completed within 10 minutes with your own personal loan advisor. We'll personally find the most competitive rate for your wedding loan. On Approval, the funds are transferred to your chosen bank account. There are often many unforeseen expenses that arise when planning a wedding. A wedding loan can will ensure that you can afford the wedding of your dreams. Most couples have an idea of their dream wedding, but sometimes they don't have the money readily available to make it happen. 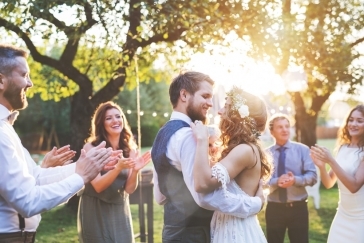 When this happens, a wedding loan can be used to cover expenses for their big day. What are the benefits of a wedding loan? You can pay for expenses including the venue, catering, dresses and the wedding ring. Budgeting is easier with one regular payment required to finance the loan. You can begin paying off the loan before the wedding day. Wedding planning is an exciting process and with so many options available, it's important to be organised. Research indicates that the average Australian couple spends 1 year and 5 months planning the details of their wedding. However, despite this length of preparation time, up to 60% of couples still go over budget on their wedding. According to the Australian Securities and Investments Commission, the average Australian wedding costs around $36,2002. Other research shows that the honeymoon often costs an additional 25% of this price. What is the trick to budgeting for your wedding? Make a plan and stick to it. Articles and advice to help you plan your dream wedding.